Air Marshal Stephen Dalton, who has been named head of the Royal Air Force, is a fighter jet pilot who flew Jaguars and Tornados. AM Dalton, currently the deputy commander-in-chief of personnel based at HQ Air Command, RAF High Wycombe, will start his new role as Chief of the Air Staff next July. AM Dalton joined the RAF after graduating with a degree in aeronautical engineering from Bath University. He flew Jaguars on three tours in tactical reconnaissance and ground attack roles on exercises in Europe, the US and Canada. As commander of No 13 Squadron he flew Tornados on reconnaissance missions over Iraq. AM Dalton commanded the RAF's Jaguar force and RAF Coltishall in Norfolk for two years from September 1997. After being promoted to Air Commodore he was appointed as director of the Eurofighter programme assurance group at the Ministry of Defence. While director of air operations at the MoD he was involved in the preparation and conduct of the British contribution to the multi-national campaign in Iraq in 2003. 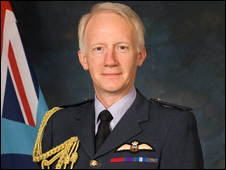 He took a place on the managing body of the RAF, the Air Force Board, with the titles of Controller Aircraft from April 2004, and Director General Typhoon from May 2006. AM Dalton, 54, who has been in his present post since 2007, will replace Air Chief Marshal Sir Glenn Torpy.